Another “Low Carb World Tour™” Recipe from Haikuman. 2 Pounds Beef tenderloin, London Broil, thick Top Round steak or other very lean cut of beef. 2 Heads of Romaine — enough to attractively cover a platter with leaves of a usable size. 3 Small cucumbers — cut in half lengthwise, scrape out seeds with a small spoon and thinly slice. Moisten surface of beef with a little Soy Sauce (This helps the pepper stick a little better.) Rub coarsely ground black pepper on both sides of your lean cut of beef. Allow meat to warm up a little before grilling. Grill beef quickly over high heat until quite rare (or perhaps medium rare for the faint of heart). Perhaps as little as 3 or 4 minutes per side for a 1 1/2” steak. Allow beef to rest at room temp for 1/2 hour or so, then refrigerate until totally cold - about two more hours (or overnight). When cold, trim off any fat and slice across the grain in 1/8” slices and then into bite-size pieces. Toss the beef with a mixture of the chopped cilantro, chopped basil, sliced shallots and the finely minced jalapeño. Prepare the dressing comprised of the minced garlic, Fish Sauce, Stevia, and lime juice - mix well. Taste by dipping a piece of lettuce into the sauce. If it is too tart, add a tiny bit more Stevia powder. If it is too sweet, add more Fish Sauce. Taste again. Pour this dressing over the sliced meat and toss to coat. Cover a large platter with Romaine leaves. Arrange the tomatoes around the outside, overlapping the slices, Arrange very thin seeded cucumber slices inside the tomatoes. 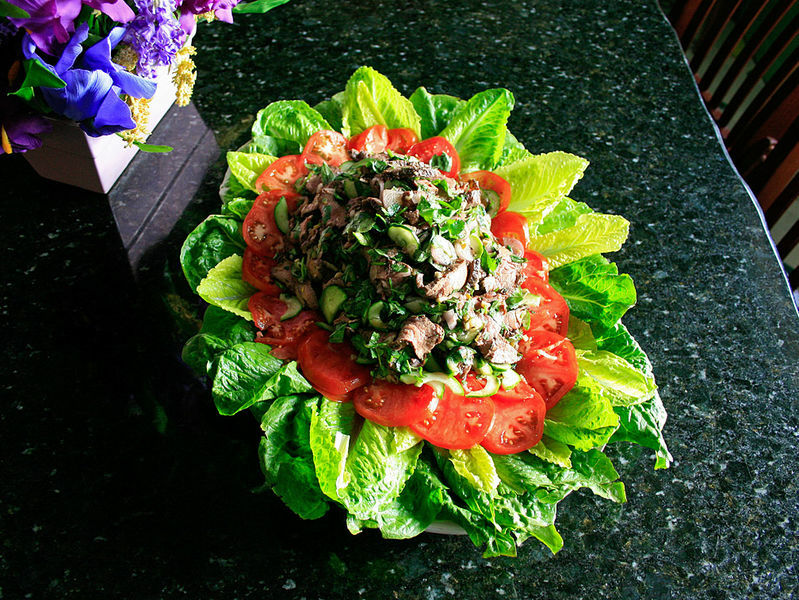 Remove the meat from the dressing and mound in the center of the platter. Pour any dressing that remains over and around the meat. Cover with plastic wrap and refrigerate until chilled to meld the flavors, at least 1 hr. and no more than 3 hrs. - or the lettuce will wilt. Before serving, sprinkle with fresh black pepper, and garnish with lime wedges. Pull out a lettuce leaf, arrange some beef on it, roll it up and eat it or move some of everything to your plate, freshen with a squeeze of lime juice and eat it like a salad. 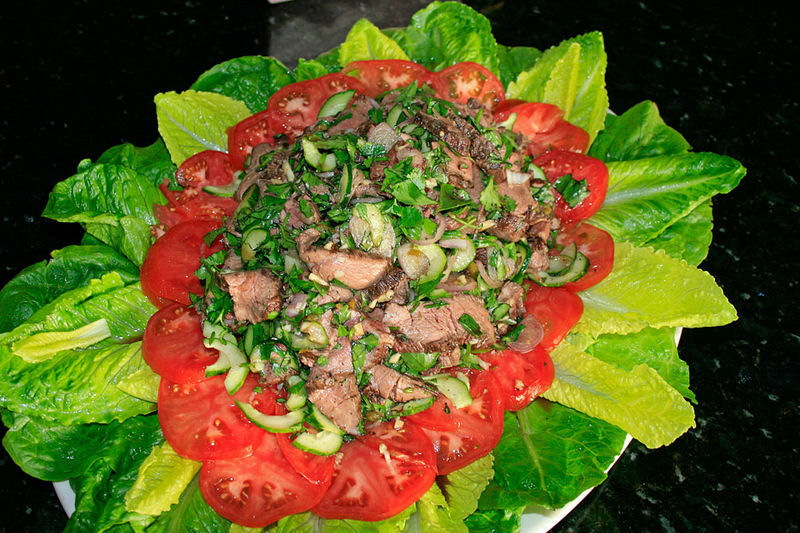 Some cooks will toss the shallots(or red onion), cucumber and tomato slices with the beef and place that mixture on the lettuce leaves.